Lava Lagoon is the eighth level of Donkey Kong Country 2: Diddy's Kong Quest. It is also the third area of Crocodile Cauldron. 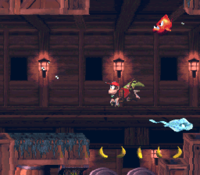 This level takes place in the cargo hold of a crashed Kremling galleon, which is full of boiling hot water that the Kongs cannot swim through safely. Fortunately, Clapper the Seal is located all around the level to cool down the water to a survivable temperature for both Diddy Kong and Dixie Kong. 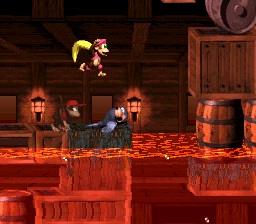 The water stays cool only for a limited amount of time, so the Kongs cannot waste any time while in the liquid. This level is populated by Neeks, Klampons, Flotsams, Lockjaws, Puftups, Kaboings, Click-Clacks, and a Klobber, who are not affected by the hot water. Luckily, Enguarde the Swordfish appears in this level, and he can help the heroes defeat enemies and move faster through the water. Unlike most levels in Donkey Kong Country 2, there are two letter N's in this level. However, after one of them is collected, the other one disappears. The primates begin the stage on some large crates and barrels with a small pit ahead of them that is full of hot water. A DK Barrel and some bananas float above this pit. After the heroes pass a nearby Neek and climb over a pile of crates, barrels, and other objects, they can find a Clapper and a large pool of water. By jumping on the seal, they can cool down the hot water so that they can swim through it. In the water, they can find a Flotsam, some bananas, and a single Banana Bunch. Some large crates float on top of the water, and a Klampon walks along them. If the heroes continue to the east from here and make their way to the other side of the water area, they come along some more large crates and past a lone Klampon. Soon, they discover another Clapper next to a pool of water, which they must cool down with the seal buddy. As they swim through the wide, underwater area, they come past a few Flotsams and some bananas. A Banana Coin is also hidden in this area in an alcove that is guarded by one of the Flotsams. Once the primates make their way to the other end of the water area, they reach a few more large boxes that they can walk on. They can find a Clapper with a DK Barrel above it in this area near a pool of water. As they travel through the water, with the help of the Clapper who can cool it down, they approach the letter K and some bananas in a few small alcoves. One of the alcoves, which contains several bananas, is guarded by a Flotsam that moves back and forth in a horizontal path. After the Kongs pass this Flotsam and another alcove that contains a Banana Bunch, they head up a passage leading to the north with an additional Flotsam in it. If they continue upwards from here, they reach the surface of the water, where they can find two large barrel platforms with an Auto Fire Barrel on one of them. The Kongs swim through an underwater area and avoid a Flotsam. The Auto Fire Barrel can blast them upwards into a higher area with another Auto Fire Barrel in it, which can then shoot them onto some crates. As they shoot through the barrels, the water level quickly rises. Additionally, after shooting out of the first of the Auto Fire Barrels, the primates can move along the left side of the wall to head through a crate and into a thin area that contains another Auto Fire Barrel, which can blast them onto the higher crates and to a Banana Coin. After the heroes reach the top of the area with either of the two paths, they can find a Klampon and another Clapper next to an area of water. Once the seal cools down the water, they can safely swim through to find some bananas along the ground. Some Flotsams and two Lockjaws also swim through the water, which the letter O is located above in an alcove. A small gap is also placed at the top of the underwater area, and if the primates jump through it, they can find an area above the water that contains an Invincibility Barrel. If they continue through the water from here, they soon reach a Banana Bunch in a small alcove and a passage leading upwards, where the heroes can find some large crates above the surface of the water that hold a Klampon. A Star Barrel is located above these crates. Two small gaps full of water are ahead of here, and a Kaboing jumps on the thin platform between them. There is a Clapper placed after the pits, and the heroes can bounce on the helper to cool down a nearby area of water. As they swim through this water, they come up to a DK Barrel and a few crates in the bottom-right corner of the area that they can swim through to find a hidden room with an Animal Crate containing Enguarde in it. A Banana Bunch is also located next to this crate. If the primates head west through the underwater area, they make their way past some bananas and Puftups. After they pass the foes, they make their way up a passage that take them to some large crates and barrels positioned above the surface of the water. A Clapper is on these objects, and once the heroes approach it, the water level rises. After the water rises, the heroes must make their way through a passage that is placed above a group of bananas that form an arrow pointing upwards. If they follow the arrow and head upwards, they make their way into a large area full of Lockjaws. Dixie drops into a gap located under a DK Barrel. A hidden passage over some crates is in the top-left corner of this wide room, and it leads the heroes to many collectibles, including bananas, two Banana Coins, and the letter N. As they head through the passage, they can also, in the Game Boy Advance version only, find a hidden room with a Lockjaw in possession of a photograph in it. If the primates do not travel through this hidden path, they must instead head through a wide room full of Lockjaws. Some bananas and another letter N are located around the area for the heroes to grab. Eventually, the Kongs make their way to the surface of the water, where they can find some large crates and barrels that they can walk on. A No Animal Sign is in this area; once it is passed, Enguarde disappears, and the heroes are awarded with a red Extra Life Balloon. There are some large crates, one of which that holds a barrel, ahead of the sign, and the heroes must climb over it while dodging a single Click-Clack to reach a small gap and a DK Barrel. Once they drop into the gap, they can find a thin passage leading to the west that is full of Click-Clacks. At the end of the passage, they can find a Clapper next to a pool of water. As they swim through this water, they come past several Puftups that rise and fall in the water. Alcoves are also scattered throughout the area, and they contain bananas and a Banana Bunch. Soon, they Kongs make their way into a thin passage that leads to both a small area with the letter G in it and another room with a Clapper in it. 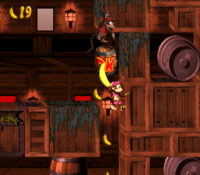 A hidden area can be accessed if they swim through the crates to the right of the Clapper, and it holds several bananas, an Invincibility Barrel, and a DK Coin. An Auto Fire Barrel is also located at the end of this hidden room to blast the heroes out of the water before it burns them. If the primates do not take this hidden path, they must instead swim upwards through a narrow passage to reach the surface of the water, where they can find some large crates and barrels with a Klobber on them. An End of Level Target follows the enemy, and the level is completed successfully if it is jumped on. Additionally, if the primates use a nearby Dixie Barrel and blast to the target with it, they complete the level and win a prize. K: After the heroes pass the second DK Barrel in the level, they must head downwards into the water to find the letter K in a small alcove. O: In the middle of the third area of water in the level, the heroes can find the letter O slightly above the surface of the water in an alcove. N: The first letter N in the level is located in a large room found shortly before the No Animal Sign. N: Another letter N is located in this level. After the heroes pass the second Clapper from the Star Barrel, they must travel north through a passage that leads into a wider area full of Lockjaws. They can find a hidden passage over some crates at the far left side of this area, and as they swim through it, they come up to the second letter N in the level. G: The letter G is located at the bottom of the area in an alcove placed immediately before the final Clapper in the level. Enguarde defeats a Flotsam in a Bonus Level. After the Kongs pass the No Animal Sign with Enguarde pictured on it, they can find a barrel that they must use to bust open the side of the crate that it sits on. Once they enter the opening created in the crate, they are sent to the level's only Bonus Level, where they can find Enguarde and a long path between many large crates and barrels ahead of them. As they head through the long and curvy area, they must use Enguarde to defeat 10 different enemies, including Flotsams and Puftups. Once they reach the end of the area, they can find a No Animal Sign; when they pass this sign, Enguarde disappears, but they are also given a Banana Bunch (or a red Extra Life Balloon in the Game Boy Advance version of the game). If the primates have defeated all 10 enemies within 35 seconds, they can find a Kremkoin after they pass the sign to collect within the remaining time. The DK Coin is near the end of the level where the final Clapper is located. After hitting the seal, the Kongs must travel into a thin alcove to the right of the Animal Buddy and then head downwards through some crates to reach a hidden area. Here, they can find an Invincibility Barrel and a DK Barrel, followed by a trail of bananas that lead up to a DK Coin. When the heroes reach the first Klampon in the level, they must use their Team-up move at the edge of the platform it is located on and throw one another straight up into the air. If they throw one another in the correct spot, a Warp Barrel appears and sends them into a Bonus Level, where they can find a group of bananas that form an exclamation mark. By walking to the rightmost side of the area, they can exit the Bonus Level and be lead to the end of the level next to the End of Level Target. The Golden Feather is hidden near the end of the level shortly before the final Clapper in the level. If they head above the last two Puftups in the level and feel along the crates above them, they can find a pair of crates that they are able to jump through to reach a hidden area with the Golden Feather in it. After the primates hit the second Clapper after the Star Barrel, they must head to the left and then swim upwards. If they keep swimming upwards and brush against a few crates in the corner of the area, they can go through the wall. They have to make their way through a narrow path between several crates, until they swim under a small alcove with a Lockjaw in it. A camera icon is above its head, indicating that it is in possession of a photograph. After they swim through some crates to reach the alcove, they must use Enguarde to defeat the enemy. Once it is defeated, they are given a picture of a Lockjaw for the fourth page of their scrapbook. Diddy jumps over a pit of hot water. The Kongs bounce on a Clapper in the Game Boy Advance version.